Mooching around hotels and other types accommodation; it’s one of our favourite pastimes. Over our years in Turkey, we’ve been able to have a good old nosy around quite a few hotels. Either because we happen to be staying there, or, usually in the case of Fethiye, well, we just go and ask. That was kind of the case when we went to have a wander around Leytur Hotel in Ovacık, recently. The official name of Leytur Hotel is actually Hotel Leytur. But, if you see it around online, you’ll more likely see the first title. In Turkey, though, it’s common to put ‘hotel’ before the name. But anyway, how did it come about that we ended up wandering around a hotel in Ovacık; a place we often pass through but very rarely stop in? Well, actually, we’d been to Ölüdeniz Water World. 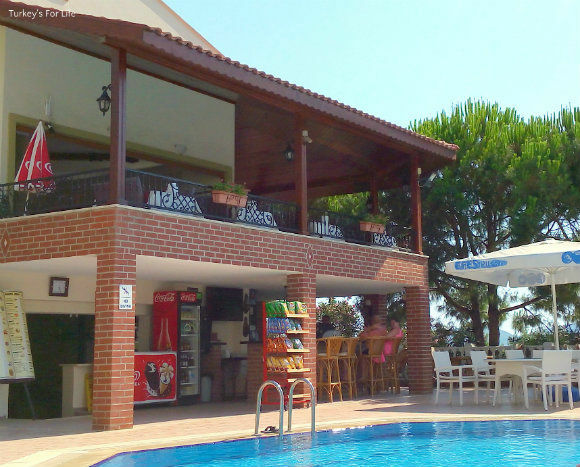 And, as that is in Ovacık, too, and as Leytur Hotel is within walking distance of the aqua park, we thought we’d kill two birds with one stone. It’s all to do with that tiny world of Fethiyespor, you see. Remember our first visit to Lukka Bar in Çalış? That was because the owner’s brother is a Fethiyspor supporter. And our trips to both branches of Baba Fırın bakery? That was because they’re Fethiyespor supporters. And one of the guys at Baba Fırın; well he’s good friends of another Fethiyespor supporter who also happens to be the son of the owners of Hotel Leytur. And well, we kept saying we’d go and visit to say hello…and we never did. But then, bingo, we got an Ovacık moment so off we went. As the son works at the hotel, too, and because we always see his Facebook updates, we were pretty certain our little jaunt wouldn’t be wasted. He’s always there during the summer months. And, as we walked through the entrance and followed the path around to the bar, restaurant and pool area, sure enough, there he was at the back of the bar. It was lovely to surprise him and say hello. But it was also a lovely surprise to be face to face with a really smart family hotel that has, for hotel standards, an ample-sized swimming pool, too. 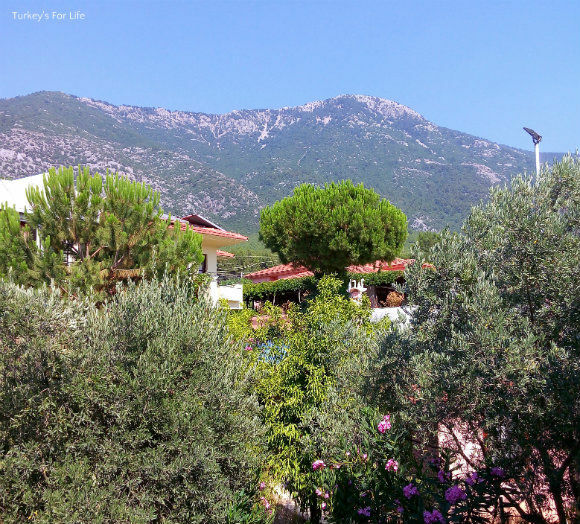 We’d seen Leytur Hotel loads of times from the dolmuş en route to Ölüdeniz but we had no idea that behind all those lovely pink-flowered oleander shrubs, there was all this going on. How tempting does that Hotel Leytur swimming pool look in the heat of summer? Yeah, if you’re someone who loves a decent swimming pool – either for getting a few lengths in or just generally messing around in – the Leytur Hotel swimming pool will do the trick. We had our swimming stuff on because we’d come straight from the water park. We were hot because we’d walked between the two so we were tempted to ask if we could cool off. But then two ice cold beers that appeared on the bar proved to be an equally good substitute. Always the case isn’t it, eh? It was nice to see Egemen (the guy we went to visit) in his work and family environment. We only ever see him in winter either at football matches or around town at various bars and eateries. In summer, his work and family time (his mum also runs the hotel) is all here, in Ovacık at Hotel Leytur. Whilst 55 rooms might seem a lot, the whole place very much has a family feel. Guests who come here love the place and book year on year. Guests who used to stay here and subsequently fell in love with Ovacık and bought holiday homes or permanent abodes, come back here just to visit. Everyone knows Egemen and Leyla (mum) and other long-term staff. As we sat at the bar, it was just a lovely friendly atmosphere. The bar and restaurant are open to the public so we didn’t feel like we were intruding when we bobbed along for a visit. And Egemen told us that a lot of those people who bought properties around Ovacık still come to eat and drink there in the evenings, sometimes. So it’s a really comfortable hotel and the gardens around the grounds soften the whole space. Isn’t this just a lovely exit from the central pool and bar area towards the rooms? Roses and bright pink bougainvillea climb around decorative wrought iron and between the balconies of the rooms. There are ground floor rooms, too, if you’re not in a position to climb steps or stairs but the rooms we saw were higher up. It’s always lovely when businesses are family-owned because you can see the personal thought and care that goes into not just the running of the hotel but the actual structure, too. All rooms are en-suite, of course, and there are twin rooms, double rooms and triple rooms. If you’re a family with kids, you can also book a Leytur Hotel family room. The rooms are a good size with TV and wardrobe space etc but Leyla told us some of the their guests who are couples like to book a triple room just for that extra ‘spreading out’ space. Well, we love a triple room for that; don’t you just always end up with your clothes all over that spare bed rather than in the wardrobe where they should be?! All part of kicking back and being on holiday. And then, what we liked about the Leytur Hotel family room is, if you have kids who are a bit older and you all want a bit of privacy, they have separate doors – kind of a two-rooms-in-one. You all get your own space but the kids are not completely on their own, either. But this is what we really like about Hotel Leytur. The hotel accommodation is arranged in an L-shape around one side of the pool. That means every balcony from every room has a view of the pool. And, if you’re high up, you get a view across the mountains, too. And when you exit the room to go down to the pool or wherever, you have typical Ovacık views like the ones below. 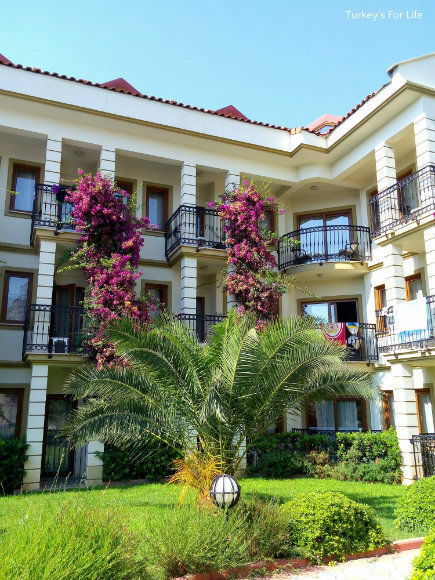 Hotel Leytur is in the Ovacık neighbourhood of Fethiye, between the centre of Fethiye and Ölüdeniz. If you are someone who finds the summer heat at sea level a bit stifling at times, the Ovacık hillsides have much fresher, cooler air (don’t worry, it’s still hot and sunny for swimming). 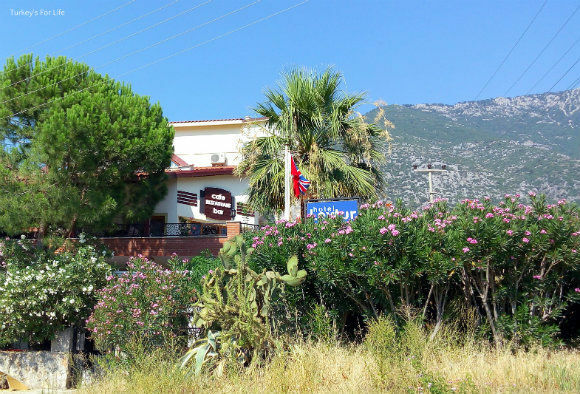 Leytur Hotel is 2 minutes walk from the main road. Close enough to reach to catch the dolmuş and far enough away to be away from road noise. There is a bar, cafe and restaurant where non guests are also welcome. You can take the dolmuş either way, to Hisarönü and Ölüdeniz or in the opposite direction to Fethiye. In summer, the dolmuş is every 5 minutes so you never have to wait long. The less frequent dolmuşes to Kayaköy (Ghost village) and Faralya/Kabak also pass along this road. Ovacık has a bar and restaurant scene of its own but if you want a change in nightlife, the dolmuş from Ölüdeniz runs until around 2am in high season. The last dolmuş from Fethiye is around 1am. Check with drivers if you’re here in low and mid season as they will be earlier. You can book rooms at Hotel Leytur through Booking.com. We have owned a villa in Ovacik, since 2005, one road away from Hotel Leytur. Several of our relatives have stayed at Leytur & enjoyed it, Leyla & family are lovely. They hotel is very well appointed & the refurb is well done. My sister-in-law is now happy enough to travel & stay alone (at Leytur) in Sep17.. Ovacik itself is now very upcoming – the main road never used to have anything much but now has many restaurants (Shiraz, Saffron, new Livardi steak house, etc, plus the new Water Park off the main road (as well the original one on the main road), & new Go-Ape style Fethiye Adventure Park with zip wires, Indiana Jones bridges & bungee; different levels for all age suitability (great fun). Just go visit & don’t think Ovacik is ‘out of the way’ as it is so not. Enjoy Turkey. Fab country, fab people. Thanks a lot for your comment, Kim. 🙂 Great to know single female travellers feel safe coming to Turkey – and of course, we know Hotel Leytur would look after your sister-in-law. It’s definitely one of those hotels where people return to, to see Leyla and Egemen as well as other staff and great your sister-in-law feels comfortable staying there. Think we need to pay a visit to Leytur, ourselves, again, soon. I can vouch for the food as I had lunch here with friends in October 2017. I was also lucky enough to be given a tour of the hotel and it is lovely. I usually stay in a friend’s apartment in Ovacik but if that isn’t available then Hotel Leytur would be my second choice.